Heat a skillet and sauté onion and garlic in it for about 5 minutes. Chop up 10 oz. spinach, mushrooms, feta cheese and shredded cheddar, and mix in. Season with pepper and salt. Partially fill a pie crust with it. Whisk 1 cup of milk and 4 eggs together, season with pepper and salt and add to the spinach mixture in the pie crust. Bake for 15 minutes, add cheddar cheese and bake another 40 minutes. 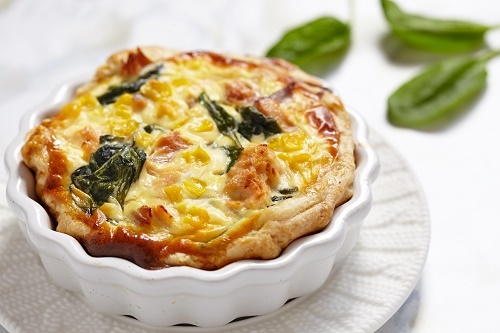 Allow the quiche to cool for 10 minutes before you serve it.